No, I meant wire it up like the dreaded wind turbines, and feed into the National Grid! But making gearing out of cardboard is too tricky, balsa is worse and I could not get planning permission. In the old days, the gears were made out of wood ..................and on water mills too. Yep! Apple, Cherry and Hornbeam. Try getting enough of them today. We could send you some from France .......................there's loads of it here. BUT chips from the main timber from when it was cut up for furniture, gear teeth etc. Also please remember that due to climate restrictions England, Yorkshire in particular, is best regarded as a bbq free zone. Off topic: bought a mini bar-b-que from Maplin. 8 sausages and maximum capacity is reached. Great for camping. I am not really au fait with Wordpress so thought I would have a go. Trams and urban railways will be part of the layouts in the loft. As for the three rail; I like it. I'll soon be joining in with the cutter revolution as I got mine last week. Still learning how to use it but my grandson now has an incredible number of paper aeroplanes. I'm still having problems with the alignment or cutting out the wrong bits but we'll see how things develop. As far as I can see this will save a lot of bad cutting on things like windows and small building detail when I'm doing the backgrounds and scenery. Above is my attempt at a tram shed. 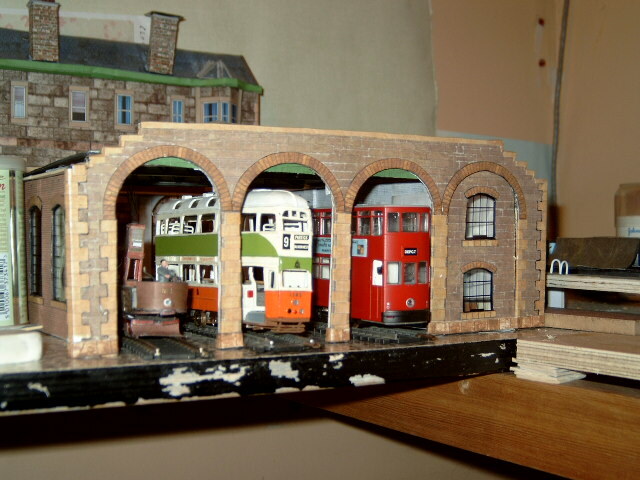 It started life as the back half of the "free" bus garage given away by John Wiffen in the Hornby modeller magazine. Hornby give you the front half and John has the back half on his site. This was all done freehand but it may well work. Now all we both need to find are some bogies or trucks with really low motors so that we can mount them under internal seating. Recently bought a Silhouette Portrait for cutting tram bodies out of card since it’s nearly impossible to find any kits etc and I have been trying to master the thing since before Christmas. Now don’t misunderstand me. The actual machine is great and will save me a tremendous amount of intricate cutting out but the alleged instruction manual is about as much use as a fart in a Jacuzzi. The way to get information is to look at the enthusiasts videos on Youtube. On a tangent, has anyone ever told Donald that here in Yorkshire a trump is a fart? Back to the actual thread, the sellers are not the least bit helpful which does not get the machine off to a good start but perseverance and experimentation will produce results and you will only get better with time. 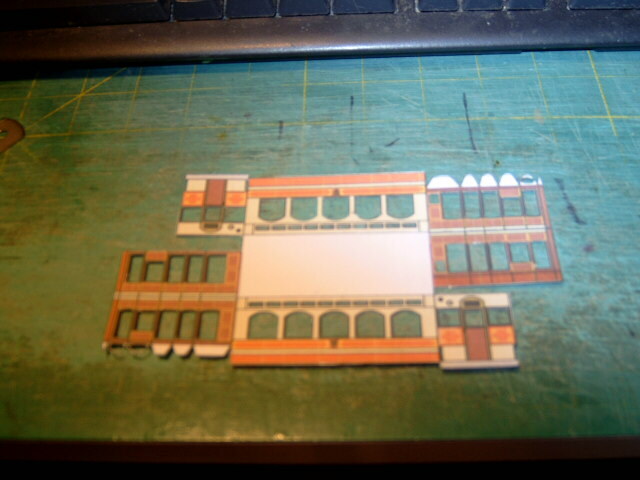 The lower saloon body shown below took an entire day to cut out but each succeeding one will only take 15 minutes and that will save an incredible amount of time when I do things like windows for the street scenes. All told I would recommend getting one of these machines if you have a lot of cutting out to do. The folded and glued box. This is a trial piece and will not go any further due to printing and design flaws. That looks nifty Jim - I wouldn't want to cut that out by hand regardless of how long it took. How thick is the card ? The card is 210gsm slightly more than 0.1mm but to be more exact I need to get some batteries for my digital calipers. The card is from Staples so I have no idea who you could get it from where you are. Cereal packets are stiffer but need to have a printed layer glued over them as they are the wrong colour. This means either cutting out twice or problems with the glue fouling the cutter. Two cutouts are no problem with the machine but alignment is as the glue needs to be wet enough to allow for sliding into place but not so wet as to soften the printed paper and some of those window frames are less than a millimeter wide. All my card trams up to press are hand cut. Sharp knife, steel rule, a lot of swearing and a chisel blade (wood chisels work fine but the cost of a set of fine carving chisels is extortionate) for corners and small straight edges. Ohhhh yeah and in my case a desk magnifier lamp. Anyone going to the York show over Easter? Once more just to stop the thread becoming stale this is a general update. My original test track (circa 1978) has finally been fully wired and I can now run my only two motorised trams the BEC Mk 1 Coronation and the Bachman Hong Kong for all of 2 feet in either direction. However this has allowed me to finalise the method for overhead wiring. This will be 0.5mm brass rod for both span wires and catenary as it means not having to strain the trolley standards in order to avoid sagging and the standards can be any rigid rod of the correct diameter with thicker tube round the base to simulate the shape of the originals. Hardly accelerated, but progress just the same. This is the original track used as a trial for Scalescenes buildings and the wires are simply thread. Me too. It has been one of those years. Hopefully back to the Cameo and trams in card.